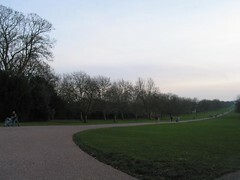 This photo is from January 2006 of the Great Park outside Windsor Castle. The path has a lovely curve before it opens up to a long, tree-lined road for pedestrians, cyclists (only on some parts) and horse-drawn carriages. Why post a photo from mid-winter in August? I thought I might want a reminder of colder days. Today was sunny and warm (even a bit humid) in London - hard to think about wool coats and gloves in weather like this.